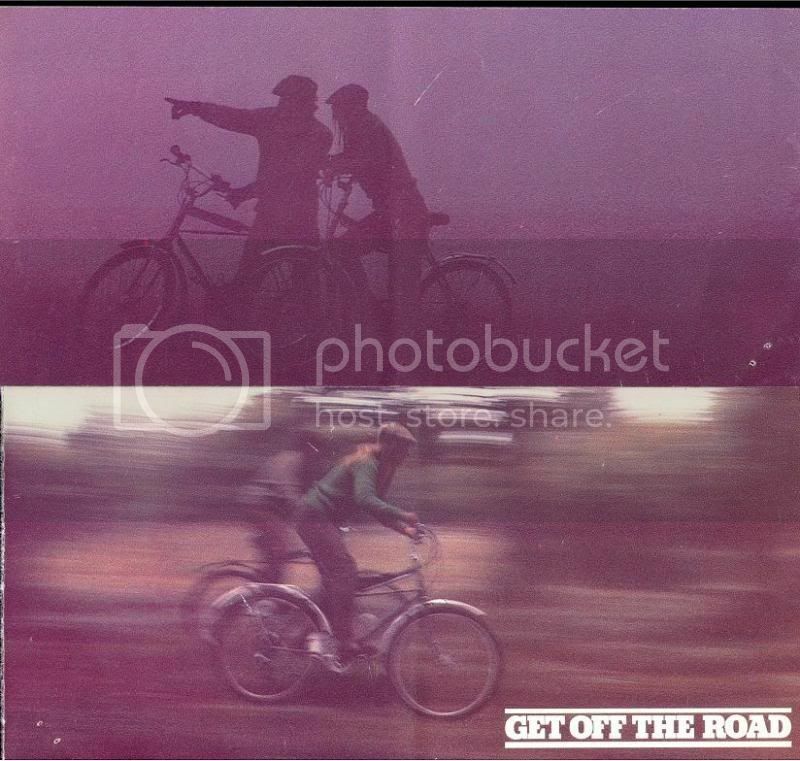 See post subject: Jack Taylor 'Rough Stuff' 1979 (1953-1974), for more Geoff Apps, Cleland Cycles and Highpath banter. Post subject: Snow Glorious Snow! Snow Glorious Snow! I had forgotten how well the Cleland's low pressure Nokia Hakka tyres, grip in the snow. Check out their tread pattern with stepped ribs connecting the knobbles and hollow knobbles on their edges for improved cornering. They work like soft rubber paddle wheels. The low pressure and 650B x 2inch size gives them a ground footprint of up to 24 square inches each and a grip on soft snow that's awesome. For instance, 1 in 3 hill climbs and fast braking without any loss of control. Because a Cleland has most of it's weight over the rear wheel there's little danger of the front wheel slipping and control being lost. If it does slip you just pull on the handle bars and lift the wheel off the ground, as a wheel that's in mid-air can't slip sideways. For ice there's the tungsten-carbide 'Stud Hakka,' studded versions. Originaly they were just work-a-day winter' tyres for use in Finland. And produced in a range of metric sizes. The big problem is... Nokia havn't made these tyres or anything like them since 1993. As we approach this years vote for induction to the Mountain Bike Hall of fame, I thought I would put Geoff Apps' achievements in an international context. Geoff designed the first purpose built British mountain bike in 1979. In 1982 he started Cleland Cycles Ltd. The first non-US Smountain bike company. The following is a list of the first mountain bike companies in chronological order. From the 1950's onwards, various off-road bikes were designed and made. Most of these were individual bikes, made buy enthusiasts for their own use. They were often based on modifying existing frames but a few had purpose built frames. In the late 1970's, a select band of enthusiasts set out to manufacture and market their designs. Below I have listed, in chronological order, the first six mountain bike manufacturers. 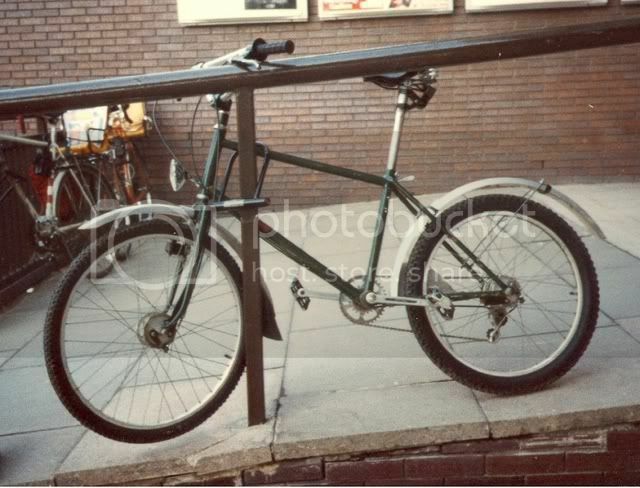 1/ 1977 Breezer # 1, frame and bike built by Joe Breeze for himself, Mill Valley, California, (Marin County), Oct. 1977. This was one of ten Breezers I built at the time. The frames were built of straight 4130 large-diameter, thin wall tubing. The term “clunker no longer applied to all bikes ridden on Mt. Tam. 2/ 1978 Lawwill Pro Cruiser. One of the bikes that bridged the gap between BMX bikes and mountain bikes. The frame design was based on frame that Don Koski fabricated from electrical conduit and a Schwinn Varsity frame. Mert Lawwill had Terry Knight of Oakland build the frames. The bikes sold for about $500 new and were made from 1977 though 1980 (approximate run of 600 bikes). This bike had only one large front chainring, so was best suited to flattish mountains. 3/ 1979 Ritchey/MountainBikes. In 1979 Tom Ritchey of Redwood City, California (50 miles south of Marin) started building fat-tire frames. From 1980 onward he built hundreds of fat-tire bike frames each year. These were the first bikes sold by Gary Fisher and Charlie Kelly, founders of MountainBikes (later the Gary Fisher Bicycle Company). Fisher and Kelly assembled the frames into bikes and sold them for about $1400.00. In 1979, MountainBikes became the first business to sell mountain bikes exclusively. 4/ 1979 Geoff Apps designed the 650b wheeled Range-Rider Cross Country Cycle for himself. 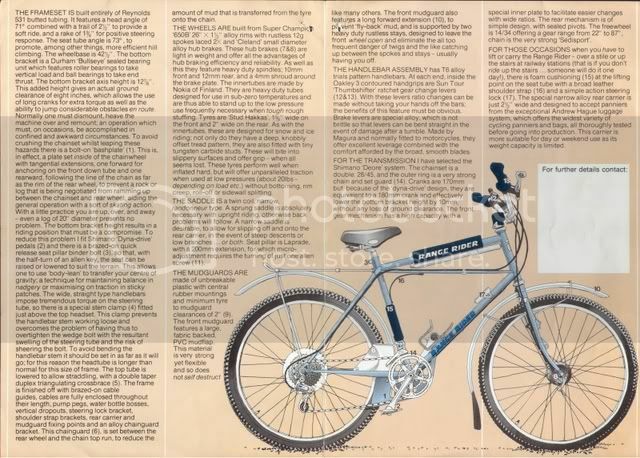 The first bike was made in England by Roy Davies at Dees Cycles of Amersham in 1979. 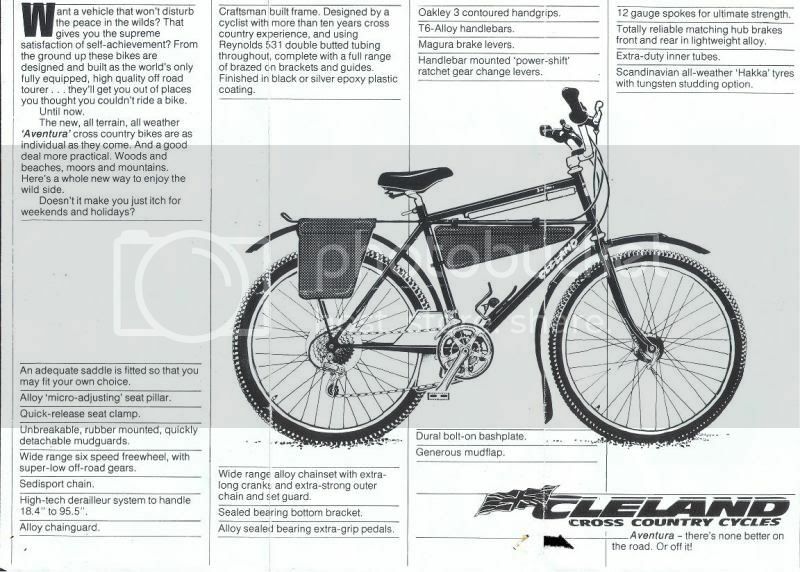 Geoff went on to improve his design and even made a 29er version in 1981. 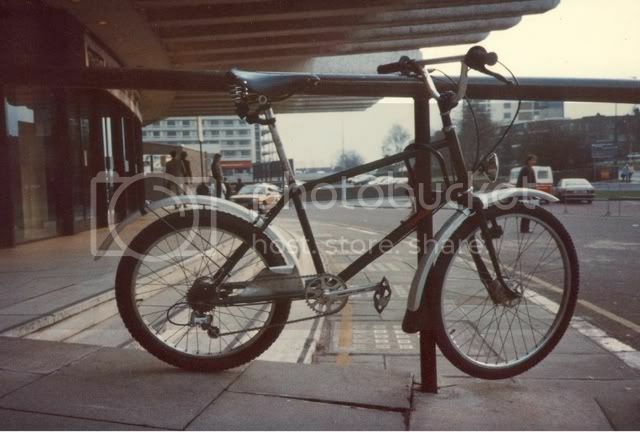 The design was eventually manufactured as the Cleland Aventura in 1982 because large British bicycle companies did not want to manufacture the design. 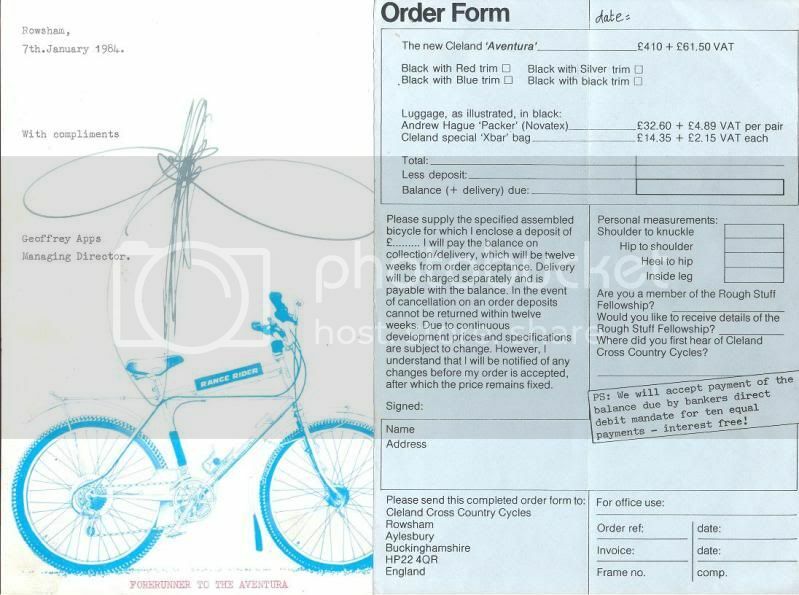 The price was about £400 and each frame was made to measure by Jeremy Torr at English Cycles in Telford, and then assembled into bikes by Geoff in Rowsham, Buckinghamshire. Cleland Cycles closed at the end of 1984 because of cash-flow problems made worse by impatient creditors. 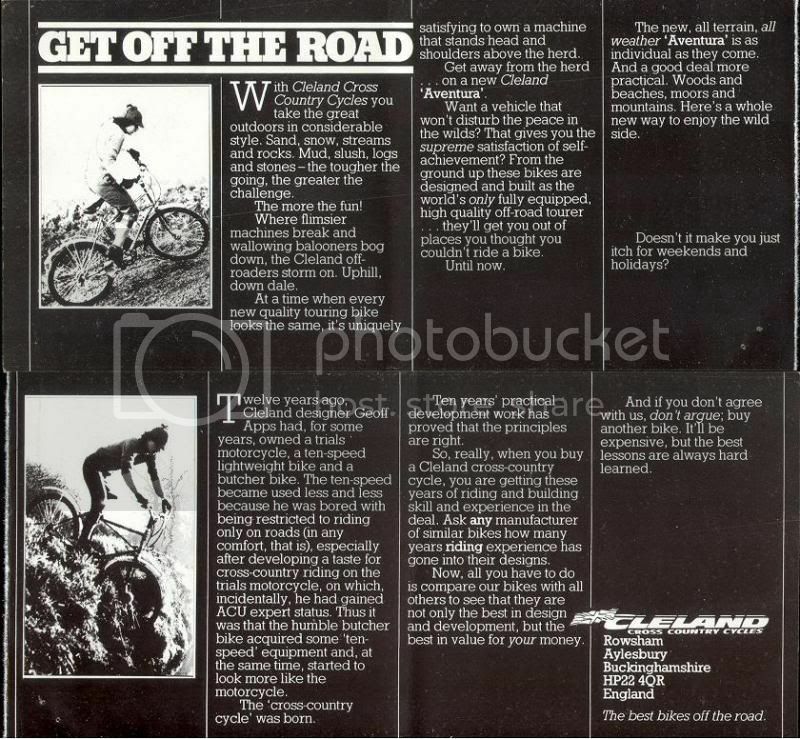 However Clelands continued to be made by English Cycles and Highpath Engineering up until the 1990's. 5&6/ 1982 Specialized Stumpjumper, made in Japan for Specialized Bicycle Imports of San Jose, California and the Univega Alpina Pro, also made in Japan for Ben Lawee, owner of Lawee Inc. parent company for Univega in Long Beach, Ca. These bikes, which first appeared at a bike trade show in September 1981, became available in 1982. The price for the Stumpjumper was $850 and the Alpina Pro was $695. Over the next two years, thousands of these bikes were sold. Of these designs the The Lawwill Pro Cruiser and 1977/8 Breezer designs died out. They were superseded by the Ritchey designs that through numerous imitations, including the Specialized Stumpjumper and Univega' Alpina Pro, went on to become a global sales and design phenomenon. The British Clelands had to compete with often-cheaper Ritchey clones. However, due to the wet and muddy British Climate that they were designed to cope with, they developed a small but enthusiastic following. They were never mass-produced but even today, thirty years on British enthusiasts still use, restore and make new Cleland style bikes. Why? Because they still offer a unique and comfortable riding experience, they are superbly reliable and have unique technical, climbing and mud plugging, capabilities. Last year I nominated Geoff Apps for induction to the American Mountain Bike Hall of Fame. However there was strong competition in the pioneers section from the Larkspur Canyon Gang who inspired the Marin county pioneers and went on to get the most votes. As someone involved in the UK sport from its outset, I am now being widely encouraged to nominate him again this year. This time the nomination has the support of some of the big hitter- US pioneers and Gary Fisher in particular. Bitd, Geoff freely exchanged ideas with the us pioneers, they were impressed with his designs and so are very supportive towards his induction to the MBHoF. Persuading US MBHoF members to vote for a little known Brit, won't be easy. But this time we have some very influential backers. Last edited by danson67 on Wed May 02, 2012 6:35 pm, edited 1 time in total. And some earlier material and the 1984 pricelist...gotta love a man that has as signature like that! Have we got enough to make a folder in the manufaturer's section, yet? Might help crystallise things at the MBHOF. Last edited by danson67 on Wed May 02, 2012 6:38 pm, edited 1 time in total. It's wonderful that you have kept these rare and historical documents. An very early incarnation of Geoff Apps' Cleland Dingbat 24" machine. A later version of which I believe was the first bicycle to feature a twist grip gear change of Geoff's own design. 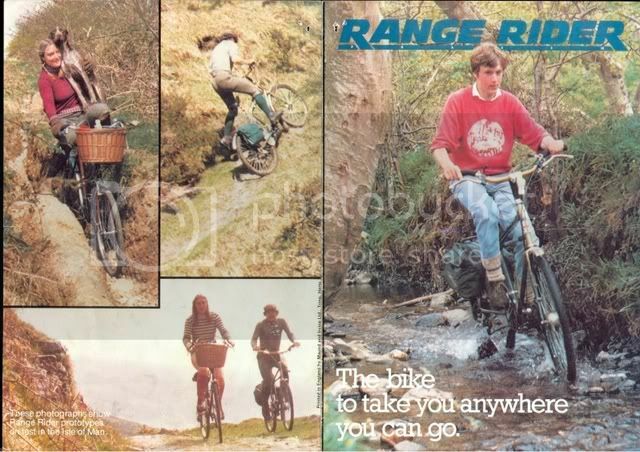 The 1984 publicity material includes many photos of a far earlier date as some show the 1st generation Range-Rider bikes being tested on the Isle of Mann in 1979. And what appears to be cross braced frames are actually frame fitting bicycle pumps placed diagonally in unbraced frames. The drawings show later 2nd phase Range-Riders from 1980-81. The fact that these brochures were created shows that Apps intended to market his machine from very early on. In reality production only got underway with his Aventura model in 1982. Amazing archive material - do we have these in a dedicated section in the Gallery yet? Love the 24" frame - what would be the reason/logic for the design BiTD?